The most up-to date version of this tree will always be on my Family Tree at Rootsweb. I had previously posted (but have not updated with all the info that is on this page) a detailed tree of the descendents of Robert JACKSON. Update August 25, 2016. Thanks to Jan Waugh, christening info on the children of Robert JACKSON and Joyce SHAW were found at Family Search, and I have made the subsequent changes to the family tree. Also thanks to these new dates and location of christenings, I poked around a bit more, and now know that the family was not only Presbyterian, but were also more likely to be from the north of England than from Scotland. I have added new sources and other potential clues at the bottom of this page . I suspect there is a relationship between the JACKSONs of Crooked Staff and the William JACKSON (1779-1812) who d 8 Aug 1812 age 33 & also 8 of his children who died in infancy, and his wife Ann JACKSON of Exhequer St., Dublin who survived him. He was buried at the Kilmainham Churchyard, Dublin. SOURCE: Jacksons in Irish Memorials of the Dead. DEED: 43-421-28800 Indenture May 6, 1724 Wm. JAMES of Athy. Co. Kildare, Tanner did demise & set to Robert JACKSON of Crooked Staff in Co. Dublin Tanner and Josiah JACKSON of Glassholly, Co. Kildare Farmer lease of house in Athy from Robert JACKSON to Josiah JACKSON for 22 years. NOTE: Was Josiah a son or nephew of the Robert JACKSON (1681-aft 1725) - the son of Robert JACKSON & Joyce SHAW? Co. Down JACKSONs: Here also lieth the body of Gilbert Jackson of Newton, tanner, who departed this life 22 Sep 1723 aged 46 years. I need to refind some records that I recalll that I once had for a Richard JACKSON (1769-1836), husband of Margaret Irwin, and son of Joseph JACKSON of Co. Tyrone. He made his fortune from leather, as did some of the JACKSONs in Drogheda in the 1600s. 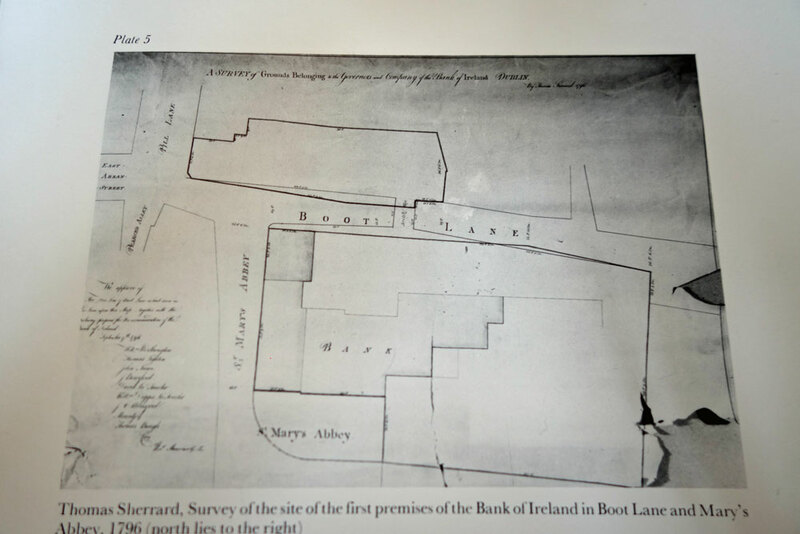 The first branch of the Bank of Ireland opened at Boot Lane and St. Mary's Abbey in 1783 in a private house previously owned by one Charles Blakeney, but had to move because of the smell of an adjacent tanyard. SOURCE: Bicentenary Essays: Bank of Ireland 1783-1983. ed. F.S.L. Lyons. Dublin. 1983. ROD: 2-44-250 Jan 11, 1708 are somehow connected to this family. Dorcas GREEN married Francis JACKSON in 1676, and the will of Francis JACKSON, a clothier, was probated in 1696. SOURCE: NA Ireland. Green Mss/III/I/p43. Doc # 27960. I do not yet know how it connects, and whether Francis JACKSON (?-abt 1676) may also be related to Michael JACKSON the clothier of nearby Pimlico. The land was described as: all those houses tanyards, backside gardens, backhouses, stables & Appurtenances held by George BLACKHALL on the south side of the Upper Comb in the Liberties of Thomas Court & Donore, Dublin, containing breadth in the front 93 ft or thereabouts, in the rere.. and in depth to Mutton Lane of 312 ft… during natural lives of Dorcus JACKSON, wife of the late Francis JACKSON & Jane her daughter, wife of the said George [BLACKHALL] & Mary JACKSON grand daughter to the said Francis JACKSON. A map drawn in 1749 shows a portion of that parcel owned by a person named Vicars, possibly a son (William VICARS) of the Joyce JACKSON, daughter of Robert & Joyce, who married Jeremiah VICARS. None of the land is still held by JACKSONs. ROD: 21-506-12291 links the names of Mary JACKSON & George BLACKALL as well as John SHAW & Henry SHAW with property at the Crooked Staff, with the house built by Henry LITTON, builder, plus other properties on S side of Upper Comb, Liberties Thomas Court & Donore. NOTE: Joyce SHAW wife of Michael JACKSON is likely related to John & Henry SHAW. ROD: 53-32-34285 Mar 23, 1726 links the names of John SHAW& Henry SHAW & Robert JACKSON  slip of land near Crooked Staff bounded as follows: on the East joining to another holding of Robert JACKSON deceased in partly with the holding of Edward COLGAN on the West. Partly to the holding of Timothy EMERSON and partly with the holding of David CARTON on the North fronting Cork Street and on the south fronting Chambers Street and containing in breadth to the front of Cork St 28 ft or thereabouts and in breadth in front Chambers St. 38 ft or thereabouts except the gateway as it was then leading in the of said Robert JACKSON dec’d other holding and in length from North to South 218 feet or thereabouts on that end the said piece of Ground near Chambers St the said Robert JACKSON dec’d had one new large dwelling house on the other and fronting Corke St. James WHITELL carpenter tenant to the said Robert JACKSON dec’d had built one other new large dwelling house. NOTE: The addition of a witness named Boyde SHAW may be a useful clue about how Francis JACKSON & Dorcas GREEN are connected to the JACKSONs of Crooked Staff etc. How does the Rev William JACKSON of Clonmell, Tipperary and also of Cork fit in (see mention in Strettle JACKSON page as well as references in deeds beneath)? It is possible that he was a Presbyterian Minister. There were congregations in Clonmell, Cork & Dublin. 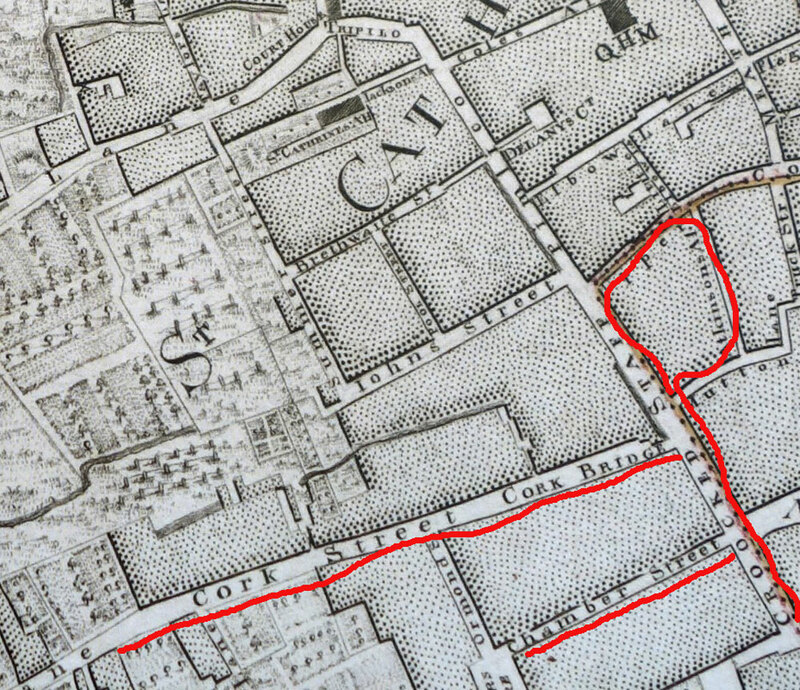 The red lines indicate streets where the Jacksons of Crooked Staff held leases in the 1700s. ROD: 11-52-3966 Jan 6, 1713. commonly known as Farley’s holdings in town of Killmainham. Next adjoining to the bridge at the upper end of Killmainham leading from the town of Kilmainham to the new hospital mearing and bounding on the East unto the Lord Ross’s land, on the North to the River of Camock or Camrick and to the West and South unto the street leading from the Town to the said bridge of Killmainham. ROD: 14-125-5580. May 16 1711. Dwelling House in Chamber St. Incl benefit of the pump. Bounded in front by Chambers St & in the rere with a stone wall belonging to the premises. NOTE: This was while Robert JACKSON sr was still alive. ROD: 14-465-66603 Jul 14, 1715 south side of Cork St in Liberty of Thomas Court & Donore. NOTE: This was to William JACKSON sometime after the death of his father Robert JACKSON. ROD 51-441-34286 Apr 2, 1726 house & backside lately in possession of Thomas [PARENCE?] on [south side] Cork St in liberty of Thomas Court & Donore, DUB, [16x85 ft] bound by holdings of MATTHEWS on south, of Bernard BROWN & Isaac ROBERTS on east, for lives of Bernard BROWN Isaac ROBERTS & Phillip [MARSIN?] at rent and renewal fines mentioned in deed. ROD: 161-374-109053 Jul 17 1753. situate in Jackson’s Alley in the Liberty of Thomas Court & Donore City. NOTE: This is more likely part of the holdings of the JACKSONs of Pimlico. 197-39-129535 Sep 6, 1758 Thomas JACKSON of Marrowbone Lane in Co & City of Dublin, Linen weaver of 1st pt... ground fronting Robert Street in Liberty of Thomas Court & Donore... NOTE: Robert Street tees into Marrowbone Lane where it turns from a westward to a southward direction in a right angle at the Tenter Fields. This is more likely part of the holdings of the JACKSONs of Pimlico. …..2-Elizabeth JACKSON b. 1686. SOURCE: St. Eustace Presbyterian Church. ………3-William JACKSON c. 31 Jan 1702, St. Catherine's, Dublin NOTE: Now that I have his father's DOB, it is clear that this has to be a son of another Robert JACKSON. I have unlinked him. +Lucy CROSSTHWAIT d. 1859, par. Leland CROSSTHWAIT and Unknown.NOTE The baptisms of their children are at St. Eustace Church, Dublin and can be found on FamilySearch film 100238 (I have not yet entered them). …..2-John JACKSON b. 1692 SOURCE: St. Eustace Presbyterian Church. · Ralph CARD, wife Angel. NOTE: A Ralph CARD is mentioned as a life along with John SHAW and Henry SHAW in relation to leases for properties on S side of Upper Comb, Liberties Thomas Court & Donore in 1718, and also in regard to the wedding of William JACKSON and Anne HUNT. · Samuel CARD was married to a Mary. On this page of Family Search, it seems that he had three daughters and no sons are recorded. · A GREEN family had a number of baptisms at St. Eustace, but I could not find one for Dorcas. · John SHAW & Henry SHAW appear as lives in a 1718 lease. A John SHAW was christened Mar 31, 1781 and a Henry SHAW was christened June 7, 1783 – both children of a Thomas SHAW & wife Ann. Notes of Memorials of Deeds relating to the JACKSONs of Crooked Staff, tanners. NOTE: Some of these memorials may be a better fit with the JACKSONs of Pimlico who were clothiers. This is not the Francis JACKSON (b 1632) in the Coleraine line (he was a clergyman – not a clothier).Dorcas GREENE married Francis JACKSON in 1676. SOURCE: NA: Green Mss/III/I/p43. Doc # 27960. A will was probated for a Francis JACKSON 1696 St. Patrick’s Close, Dublin, Gent NOTE: This Francis is likely related to those at JACKSONs of St. Catherines Church. If this is the case, then they would also likely connect to Robert JACKSON, tanner of Crooked Staff: SEE: Exploring JACKSON links between Dublin & Co. Meath NOTE: Dorcas GREEN married Francis JACKSON in 1676, and the will of Francis JACKSON, a clothier, was probated in 1696. SOURCE: NA Ireland. Green Mss/III/I/p43. Doc # 27960. Jane JACKSON wife of George BLACKHALL died intestate 1718. A George BLACKHALL was Lord Mayor of Dublin in 1694-95, but what is curious is the history of 17 Eustace St-A History has an alternate wife for him: Richard Blackhall or Blackall who settled at Black Island, Co. Limerick, from where he was expelled and robbed by the rebels in 1641.40 Richard was later besieged at Kilfinny Castle by Confederate Forces under Lord Muskerry. The third son to issue from the marriage of Richard Blackhall was George, Alderman of Angier Street, Dublin (1693), Receiver General (1693), Lord Mayor of Dublin (1694) and City Treasurer (1695). George Blackhall was removed from office with other Protestants by James II, but restored by William III in 1690. He was married on 9th September 1672 to Judith (1652-1709), the daughter of Alderman Lewis Dès Mynières, Lord Mayor of Dublin (1669), the son of Robert of Rouen, France and died in 1701 after having had issue, including his eldest son, Thomond (1674-1714) of Littlerath, Co. Kildare. Between Jonathon DODDRIDGE of the Liberty of Thomas Court & Donore, Co. Dublin, Brewer & Mary BROOKS als DODDRIDGE wife of the said Jonathon exec of Thomas BROOKS, Tanner late of the aforesaid Liberty & whereas DODDRIDGE assigned to Robert JACKSON of Liberty of Thomas Court & Donore the lands formerly in possession of Thomas BROOKS on the other side of the river on Crooked Staff in the Liberty of Donore with a Tanyard and Tanfatts thereunto belonging as also a tan house and dwelling house for 81 pounds 4 shillings... & Robert JACKSON Tanner Thomas Court, Donore, DUB Mortgage WITNESS: Francis CHARRIER of City of Dublin, Gent. NOTE: A map drawn in 1749 shows a portion of that parcel owned by a person named Vicars, possibly a son (William VICARS) of the Joyce JACKSON, daughter of Robert & Joyce, who married Jeremiah VICARS. None of the land is still held by JACKSONs. The land was now referred to as Booter Park. His will. A Memorial of the last will and testament of Robert JACKSON late of Crooked Staff in the Liberty of Donore and County of Dublin Tanner deceased bearing date the Twenty-third day of February 1711, whereby the said Robert JACKSON (inter alia) did devise unto his beloved wife Joyce JACKSON the front tenement in Crooked Staff sett to several tenants being part of the holding he therein after Bequeathed to his son Robert JACKSON [eldest son] for his use “for ever of his Dwelling House, Tan Yard, Tan House, Bark House, Mill and other Buildings and Improvements made thereon Excepting the passage or Gateway backward from Chambre Street which he did will and declare to be part of the Holding bequeathed to his son William JACKSON...” sons John JACKSON & Thomas JACKSON son-in-law Jeremiah VICKERS. Witness Abraham SPENCE, Dublin City Brewer David CARTON Dublin City Clothier John BLAND servant of Joseph MARRIOT, Gent of Dublin. NOTE: Robert JACKSON m Joyce SHAW 1680. The relationships are gleaned in the JACKSON records of St. Catherines. See: Family Tree of Jacksons of Crooked Staff. Between John BELLEW of Castleballin, Co. Galway of 1st part & William JACKSON of Killmainham, Co. Dublin, Tanner all that and those the Houses Garden and Yard with the old walls thereunto belonging then in the possession of the said William JACKSON commonly known as Farley’s holdings in town of Killmainham. Next adjoining to the bridge at the upper end of Killmainham leading from the town of Kilmainham to the new hospital mearing and bounding on the East unto the Lord Ross’s land, on the North to the River of Camock or Camrick and to the West and South unto the street leading from the Town to the said bridge of Killmainham… term of 66 years rent 12 pounds 10 shillings WITNESS: John BEE of the City of Dublin Currier and William JOHNSON of the same City Gent. Memorial WITNESS: Patrick BELLEW son of the said John BELLEW confirmed that Indorsement is witnessed by John BEE & Jeremiah VICKERS of the said City Tanner. NOTE: William JACKSON (1682-bef 1772) of Mill St, Dublin. He and Anne HUNT had 2 daughters. Lease between Robert JACKSON [d 1711] of Crooked Staff, Co. Dublin, Tanner of the one part & Arthur POTTER of Chamber St, of said Co. Weaver. Of the other part. JACKSON demised to POTTER Dwelling House in Chamber St. Incl benefit of the pump. Bounded in front by Chambers St & in the rere with a stone wall belonging to the premises… ease 51 years. Witnessed Jeremiah VICARS, Robert JACKSON jr. & William CARLING all of the Liberties of Thomas Court & Donore in Co. Dublin, Tanners. Chamber Street aka Chambre Street. NOTE: Jeremiah VICARS was a son-in-law of Robert JACKSON (d1711). Deed of Assignment made by Bernard BROWNE of City of Dublin Esq. & Nathaniel TUMBALE of the same city, clothier of house & Tenement late in possession of Thos PARENCE, south side of Cork St in Liberty of Thomas Court & Donore which had been held for lives of sd Bernard BROWNE, Isaac ROBERTSON, of Roger ROBERTS of Thomas Court Inn holder & Philip MARTIN of Plimlicoe, merchant... The said Nathanial TUMBALE did in consideration of 50 pounds sterling pd by William JACKSON of Thomas Court and Donore in Co. Dublin, Gent assign the premises to Wm JACKSON. Witnessed John BOOKER, City of Dublin, Looking Glass maker; Jeremiah VICKERS of the same City, Tanner; and William BARRY of the same, scrivener. Memorial of an Indenture of Lease dated 5 July 1715, between Joyce JACKSON widow and relict of Robert JACKSON late of the City of Dublin Tanner deceased, and John JACKSON and Thomas JACKSON sons of the said Robert JACKSON of the one part They had rented to Jeremiah VICKERS “all that house or tenement situate on the south side of Chambers Street in the Liberty of the Court of Donore and County of Dublin next adjoining to Jeremiah VICKERS on the east and to the west to Mr. PORTERs dwelling house together with the backside house of Ease and all other the appurtenances ...” for the yearly rent of £8.10s . Witnesses: Robert JACKSON a Dublin tanner. William JACKSON of Dublin, gentleman. And Robert WALLIS and William BARRY scrivener. ... delivered 1 Sept 1715 at 9:15 AM NOTE: His tree is at JACKSONs of St. Catherines. I have a copy of this Memorial, but there are no JACKSON signatures on it. John HITCHCOCK of Dublin City Needlemaker & Elizabeth PLIVIS of Dublin City, wife of John HITCHCOCK both of 1st pt & William JACKSON of Kilmainham, Dublin, Tanner of 2nd part.. WITNESS: Jeremiah VICKERS of Chambers St., Donore, Dublin. Re: house next to JACKSON's house at Kilmainham, for 41 years. An unnamed JACKSON lived in one of the houses at Combe, Dublin leased by Winfield ATKINSON to David ROBERTS, both of City of Dublin. Btw William JACKSON of the Liberty of Donore and Co of Dublin Gent of the one part & Robert JACKSON of Crooked Staff in the Liberty of Thomas Court and Donore and County of Dublin, tanner. Robert pd William 60 pounds for lease of house on south side of Cork St.in Liberty of Thomas Court & Donore... to hold for natural lives of Bernard BROWN; Isaac ROBERTS son of Robert ROBERTS of Thomas Courts Innholder and Philip MARTIN of Pimlico Merchant. For £60 to be pd by Robert JACKSON, William JACKSON releases unto Robert JACKSON house & backside lately in possession of Thomas [PARENCE?] on Cork St in liberty of Thomas Court & Donore, DUB, [16x85 ft] bound by holdings of MATTHEWS on south, of Bernard BROWN & Isaac ROBERTS on east, for lives of Bernard BROWN Isaac ROBERTS & Phillip [MARSIN?] at rent and renewal fines mentioned in deed. Thanks to notes above by Mike Stewart. Rev. William JACKSON of Clonmell, Co. Tipperary to Jeremiah VICARS, Co. Dublin, Tanner of holding & tan yard wherein Robert JACKSON, deceased formerly lived, in Crooked Staff in Liberties of Thomas Court & Donore DUB as Robert JACKSON formerly enjoyed and as Jeremiah VICARS now held, plus outhouses gardens yards backsides for 61 years from 25 March last at £40 7s. Pa NOTE: I don’t yet know how the Rev. William JACKSON was connected to the JACKSONs of Crooked Staff, tanners. Marriage Art: btw William JACKSON of Kilmainham in Co of Dublin Tanner of 1 pt Ralph CARD of the City of Dublin Esq. & John LOWTON of the same city clothier of the other part. Whereas a marriage btw Wm JACKSON & Ann HUNT dau to John HUNT late of the City of Dublin, clothier dec’d 200 pounds to be paid to Wm JACKSON as a marriage portion. NOTE: William JACKSON (1682-bef 1772) of Mill St, Dublin. He and Anne HUNT had 2 daughters. Lease btw Micajah JACKSON of City of Corke Merchant of 1 pt & Jeremiah VICARS of Co Dublin Tanner of other part. Micajah devised tenement where VICARS dwelt at Crooked Staff in the Liberty of Thomas Court & Donore, City of Dublin for term of 99 years. NOTE: IN 1761, 1761 Micajah Jackson + William Cooke were Church Wardens of St. Peters Church, City of Cork. According to notes on his mother at a Geni website. His father was a Rev. William JACKSON ((?-1734) of Cork. One possible link if to the STRETTLE-JACKSONs of Co. Cork. It is possible that the Thomas JACKSON at the start of this STRETTLE JACKSON tree was a son of Robert & Joyce SHAW. John VIZE of Donegall in Co Tipperary Gent & Joseph VIZE VIZE eldest son & heir of one pt & Micajah JACKSON & Wm BERRY both of City of Cork Merch of other pt... Ann JACKSON Woodroffe in Co Tipperary & Temperance JACKSON spinster sole daughter of the said Ann JACKSON of the 2nd pt... marriage of Joseph VIZE & Temperance JACKSON.... NOTE: Micajah JACKSON was a son of Anne PERRY & Rev. William JACKSON, and I don’t yet know how he was connected to the JACKSONs of Crooked Staff, tanners. Intended marriage (since taken place) – Micajah JACKSON intended groom of Cork City covenants that if Catherine HARE of Cork City intended bride to survive him, his Executors will pay Catherine HARE, Richard HARE, Russell HARE &William PERRY [son of William PERRY] [trustees of Cork City] £800 ster & further sums over and above the £500 she is entitled to receive on the death of any of her brothers/sisters under the Will of her father Richard PERRY, upon trusts [education & maintenance of Children ... details stained]; Micajah JACKSON releases to Catherine HARE, Richard HARE, Russell HARE &William PERRY 5 houses in Dublin city in trust in case his fortune is deficient [NOTE: These houses are described in other deeds]. John REILY, Justice present; Robert WRIXTON & Anthony LANE, Registrars. WITNESSES: Thomas SKEYS, Anthony LANE & Joshua HUMPHRY, all of Cork City. Registered March 30, 1759. NOTE: Micajah JACKSON was a son of Anne PERRY & Rev. William JACKSON, and I don’t yet know how he was connected to the JACKSONs of Crooked Staff, tanners. Jacob POOLE, Brewer of Blackpitts, Dublin of 1st part to William JACKSON, Clothier of Upper Comb in Liberties of Thomas Court & Donore Dublin Dwelling House Out Houses Backside Back House Garden Crane Loft wherein Jacob POOLE formerly dwelt & lately in occupation of William WHITLING, on s. side of said Upper Comb st. with liberty of sewer running in premises from other holdings of Jacob POOLE and of Jacob POOLE's rights of adjoining properties unto Jacob POOLE, from 29 inst Sept, 41 years, £34 ster. WITNESSES: Joseph DOYLE, Carpenter of Cole Alley, Dublin; Arthur SHEPHEARD, Public Notary of Dublin City; Michael CARROLL, Joyner of Dublin City. Thanks to Mike Stewart. Long before the opening of St. Eustace, formerly known as “New Row”, Presbyterians had been active in St. Nicholas Church, a church which also includes a number of JACKSONs in their parish registers. The first ministers of St. Eustace had preached at St. Nicholas every Sunday at least as early as 1665. SOURCE: A history of Presbyterianism in Dublin and the south and west of Ireland Clarke H. Irwin, M.A., Minister at Bray. London. p325: Mr. Mather was a Senior Fellow of Trinity, and before 1665 had preached every Lord's Day morning in the parish church of St. Nicholas, where he had been ordained on December 5th, 1656, according to the Presbyterian form, by Dr. Winter, Rev. Mr. Taylor of Carrickfergus, and Rev. Mr. Jenner of Drogheda. … In 1728 the congregation of New Row removed to the new church which they had erected in Eustace Street. " It must have been at that time considered an imposing structure ; for a Quaker, looking up at the stately front, is reported to have said, ' Where there is so much vanity without, there cannot be much religion within. Their connection of the parish of St. Nicholas to the congregations in other parts of Ireland, especially to Carrickfergus and Drogheda, is worth keeping in mind with respect to looking for clues to connections with other JACKSONs. Although St Nicholas is the church where the clothier Michael JACKSON of Pimlico was buried in 1717, most of that Michael JACKSONs children were baptized at St. Catherine’s Church (where Robert JACKSON & Joyce SHAW were married). The two parishes are adjacent to each other, and the churches would have been merely a short walk from one to the other. Given the attendance of Robert JACKSON, tanner of Crooked Staff at St. Eustace and his wife Joyce SHAW, another clue to his ancestry can be found in An Explanation and Defence of the Principles of Protestant Dissent. William Hamilton Drummond. London, 1842, p.8. : The congregations of Eustace-street and Strand-street are the only genuine Protestant Dissenting Presbyterians in the city of Dublin; the descendants, as has been affirmed, not of Scotch Calvinists, but English nonconformists— dissenters from the Church of England. St Eustace became a Unitarian Church, and William JACKSON (1690-1772) was involved at that time, as was his brother-in-law William VICARS (1707-aft1769): SOURCE: Dublin Unitarian Church Collection RIA/DUC/2/COO/7 4 March 1769: Copy of deed of assignment of Cook Street premises from William Vickers to Thomas Litton, Alexander Kirkpatrick and others. Parties: William Vickers of Dublin, chandler, of the first part; Thomas Litton and Michael Cromie and Alexander Kirkpatrick and Brindley Hone, merchants and Robert Burton, cooper and William Jackson, tanner, all of Dublin, of the second part. Property: Premises at Cook Street, Dublin Terms: Transfer of property to new Trustees with regulations concerning the appointment of subsequent Trustees. Includes: Refers to earlier leases commencing with the deeds of bargain and sale and release from Daniel Wybrants to Ralph Norris. Witnessed by James Armstrong and Thomas Vickers. Eustace Street has a rich and varied history, famous as much for its religious nature as for its bawdy houses and bars since the 17th century. Both Quakers and Presbyterians have a presence in Eustace Street. The Society of Friends Meeting House, almost directly opposite No.25, has served the Quaker population that settled in the Sycamore Street locality 200 years ago. The old Presbyterian School (now the children's centre, 'The Ark') was established in 1715, and the church served one of the richest Presbyterian parishes in the city from 1685. … On the façade of the Friends Meeting House is a plaque commemorating the first meeting at this house, which is presumed to be the site of the Eagle Tavern, of the United Irishmen, prior to the 1798 Rebellion. NOTE: The site of The Ark was the site of St. Eustace Presbyterian Church. More history at Dublin Unitarians.